The Boy Who Lived lives on in a wizardly spectacle. The world of Harry Potter has arrived on Broadway, Hogwarts and all, and it is a triumph of theatrical magic. 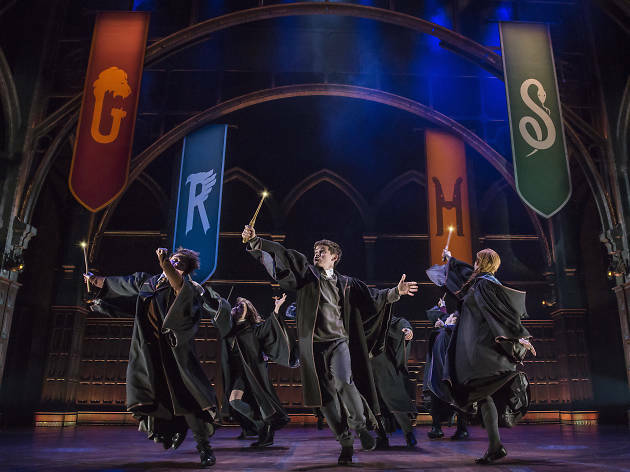 Set two decades after the final chapters of J.K. Rowling’s world-shaking kid-lit heptalogy, the two-part epic Harry Potter and the Cursed Child combines grand storytelling with stagecraft on a scale heretofore unimagined. Richly elaborated by director John Tiffany, the show looks like a million bucks (or, in this case, a reported $68 million); the Lyric Theatre has been transfigured from top to bottom to immerse us in the narrative. It works: The experience is transporting. Jack Thorne’s play, based on a story he wrote with Rowling and Tiffany, extends the Potter narrative while remaining true to its core concerns. Love and friendship and kindness are its central values, but they don’t come easily: They are bound up in guilt, loneliness and fear. Harry (Jamie Parker) is weighted with trauma dating back to his childhood, which hinders his ability to communicate with his troubled middle son, Albus (Sam Clemmett); it doesn’t help that Albus’s only friend is the bookish outcast Scorpius Malfoy (the exceptional Anthony Boyle), son of Harry’s erstwhile enemy, Draco (Alex Price). Despite the best intentions of Harry’s solid wife, Ginny (Poppy Miller), and his friends Hermione (Noma Dumezweni) and Ron (Paul Thornley), things turn dark very fast. Set designer Christine Jones and lighting designer Neil Austin keep much of the stage shrouded in mystery, the better to accommodate a continual stream of thrilling illusions and effects. 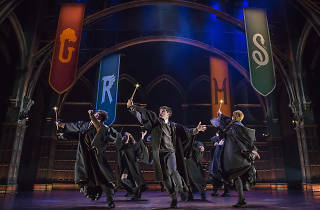 Flames surge, wands flash, diaphanous Dementors hover ravishingly in the air; when characters travel through time, the entire stage seems to quiver—and the audience with it. Harry Potter and the Cursed Child is haunted by death and pain; it is often suspenseful and sometimes downright frightening. Yet amid the cinematic tumult and dazzle of the densely action-packed plot, Thorne and Tiffany carve out quiet scenes of intimacy and tenderness. Great care has gone into creating each moment of this state-of-the-art adventure. It leaves its audience awestruck, spellbound and deeply satisfied. Lyric Theatre (Broadway). By Jack Thorne. Directed by John Tiffany. With ensemble cast. Running time: 2hrs 40mins per half. One intermission per half.